When it comes to olives, I’ve learned, there are two camps of people: They either love ‘em or they hate ‘em. Then there are some who say that they like the green ones, but not the black ones (or vicey versey.) It matters not with this cheesy bread. Even avowed olive haters have converted when they taste a bite of this bread . . . and they’ll be back for more. I do believe, though, that all the heart-healthy benefits of the good fat in olives are totally eclipsed by the butter, cheese and mayo that go into the making of this artery clogging treat. But want to be a hit at the Labor Day picnic this weekend? Take this bread. But after serving this bread several times, I’ve found there is no sexual bias. Man and woman both enjoy drooling over the melty cheese. 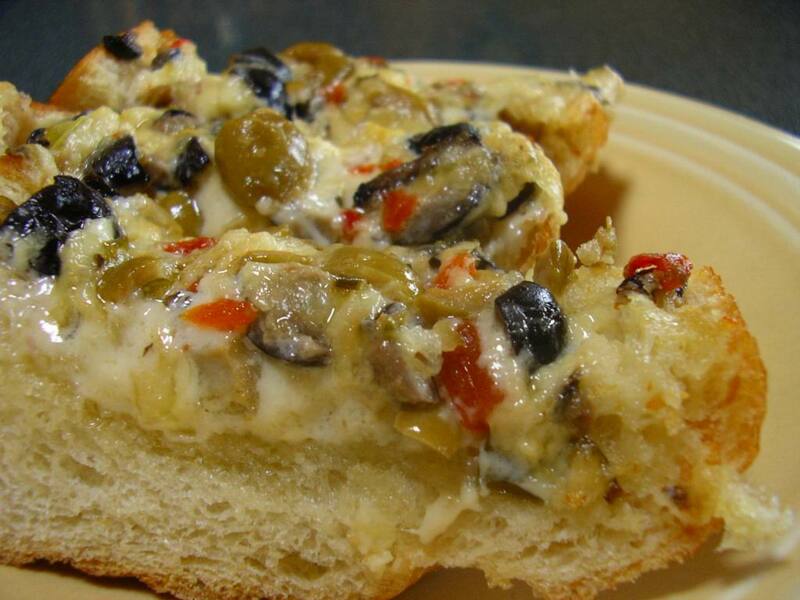 The olives seem to merely add a saltiness and definite color to the bread topping. It’s very simple, very tasty and pretty much a crowd pleaser. Even if it is just a once-in-a-blue-moon-because-I-want-to stay-healthy-treat. Hate olives? Give it a try. And don’t bother getting deli olives; the ones in the can will do just fine. There are only two slight changes I have made with this bread. I use a Monterey Jack cheese that has jalapeno peppers in it and I’ve extended the original cooking time by 15 minutes; could just be my oven, or my taste. I want a little browned toastiness to the edges of the bread and cheesy topping. * I forgot to set the DVR to catch The Pioneer Woman’s new show on The Food Network last Saturday morning. Did anyone catch it? Cut bread in half lengthwise. Divide mixture in half and spread over each half. It looks like a lot, but it will work. Bake for 40 to 45 minutes. Slice and serve. I have bookmarked thjis recipe. I know we all say that but I have some olive lovers coming this weekend! My mouth is watering! We love olives and I can't wait to try this. When I was a kid, my favorite sandwich was an olive and cream cheese spread on white bread. This looks much more grown up. Oh my, olives, cheese AND bread. Delicious! I love it! 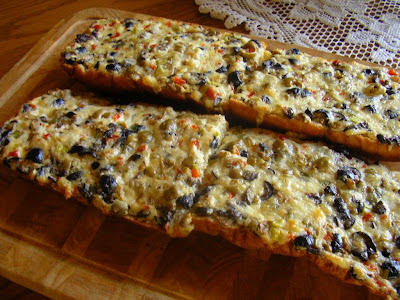 All olives - briny, green, black, stuffed - olive heaven as is this bread. Yes we love olives and I love your blog; your photos are very tempting. thank you for joining me; I am thrilled. Rosemary, I know I'm going to love this! I have a ton of olives in the fridge. Unlike the Pioneer Woman, I'd need a 10-foot cattle prod to keep hubby AWAY from this. Yum! My husband loves them...I hate them...but I love him enough to put this recipe on my "TO DO" list. Thank you for making his stomach growl! I hope you are having a terrific Tuesday evening. I'm about to head off to bed after a long but rewarding day. Much love and hugs from Austin! This is beautiful!!! Wow. For the record....I am one of the lovers of olives. Hi Rosemary, I loved this reccipe too. I had to cut some of the olives to get my kids to taste it. yummy! Just made this for dinner and wanted to tell you how YUMMY! it is :) Thanks again! I think every guest would love this bread. If I was worried that there might be someone who didn't like olives, I think I would just omit the olives on one half of the bread...everyone would be happy. Thank you for posting the recipe. You have a lovely blog.